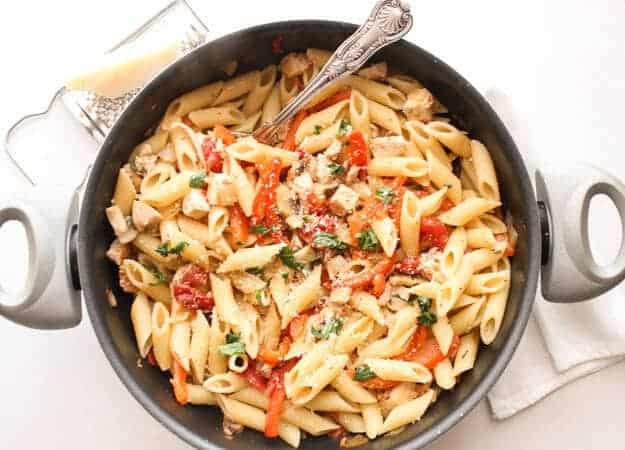 Leftover Chicken or Turkey Pasta Skillet, the perfect left over Pasta Dish, just add your favourite veggies, Mushroom and Peppers are a great choice, and some cut up left over Chicken or Turkey and Lunch or Dinner is Served. Delicious! As I plan my Christmas lunch menu, a typical Italian Christmas, Lasagna, Roast Potatoes, Roast Lamb, Roast Pork or Stuffed Flank Steak. I remember last Christmas when we were all together under the same roof. Laughing, eating, telling stories and playing Tombola. This year with my eldest daughter in Canada we are all feeling a little melancholy. 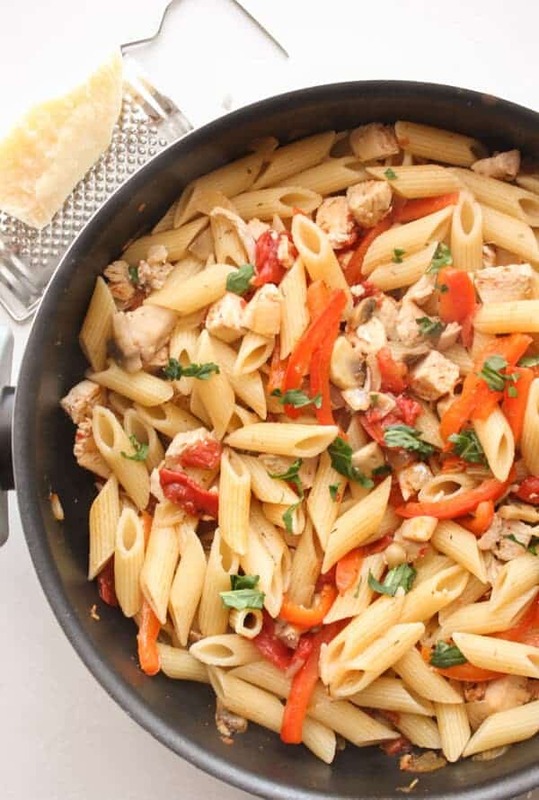 But we will Skype and look forward to our reunion.I have been making this Turkey Pasta Skillet dish for quite a while now. It is fast and easy and makes the perfect weekday meal. I imagined that with the leftover turkey something a bit different might be a happy welcome. This dish works well with either cooked turkey or chicken. 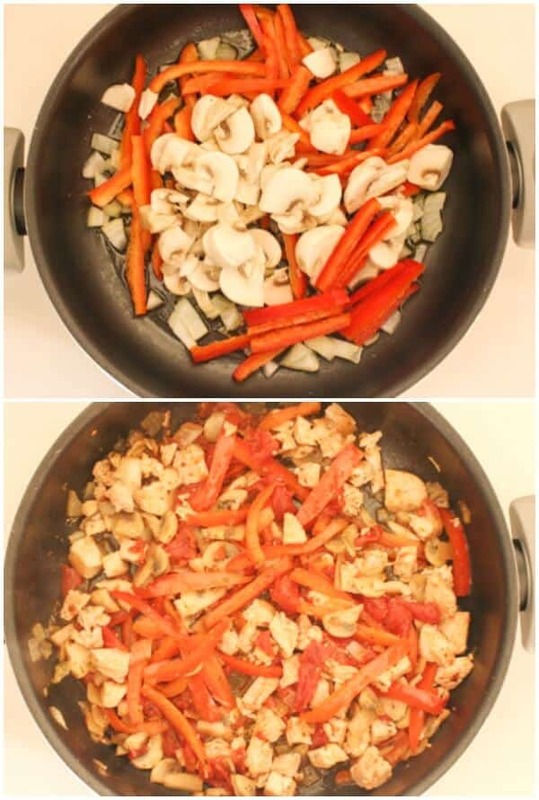 I decided to mix it up with a couple of my favourite vegetables almost like a Turkey Cacciatore stir-fry. Fast, easy and really good. 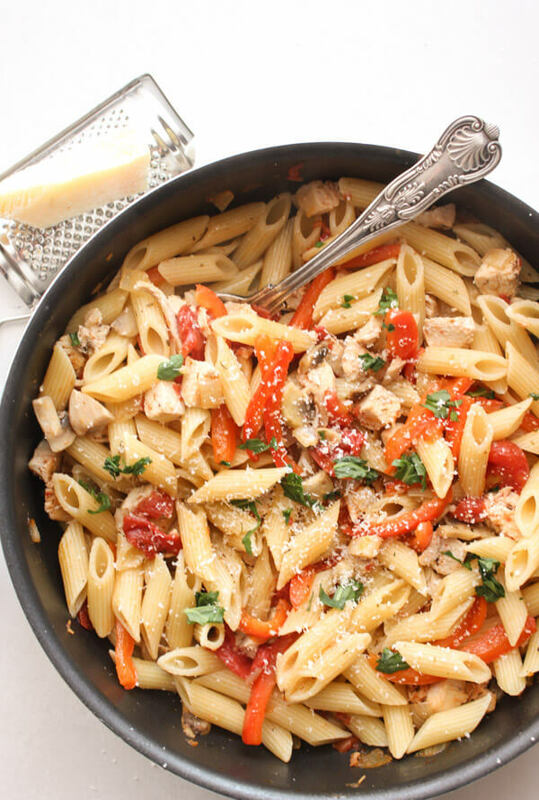 So if you are lucky enough to have some left over turkey, and you are looking for something a little different, then I think you will really enjoy this Turkey Pasta Skillet dish. Buon Appetito! 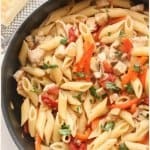 Turkey Pasta Skillet, a healthy, fast and easy leftover turkey or chicken skillet recipe, perfect weeknight or weekend meal. While pasta is cooking, in a large pan on medium heat add olive oil, onions, sliced pepper , mushrooms, oregano, basil and salt, cook for approximately 10 minutes stirring occasionally, then add white wine, turn up heat to high and cook until it evaporates approximately 2 minutes, turn heat down to medium, add chopped tomatoes and cook for approximately 3 minutes stirring occasionally, add cooked turkey (or chicken) heat thoroughly, (taste for salt) add pasta and 1/2 a ladle of pasta water, cook for approximately 1-2 minutes stirring often. Serve immediately, Enjoy! Thanks so much for this recipe, it was so good.